Mrs. Wauville thanks Martha Berry for the cotton she received and tells her that she is looking forward to her trip to the South with Mrs. Hammond. 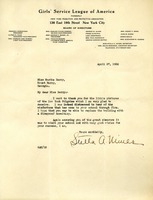 Martha Berry tells Mrs. Lawrence that the letter she has just received was a general appeal for gifts and not a reminder to pay the amount pledged. She also writes about why The Berry Schools send out appeal letters. Miss Berry goes on to speak about her work during the summer, traveling and speaking "with as much enthusiasm as [she] had 25 years ago." She tells Mrs. Lawrence about her trips into the mountains along paths that grow "dimmer and dimmer." Miss Berry says that she finds children and figuratively ties a red string around them to hopefully bring them back to The Schools. Letter of appreciation to Mrs. Lawrence for helping to get other donors interested in the Berry Schools, especially the New York Pilgrims. 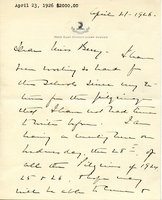 In this letter Martha Berry sends some pictures from the day the New York Pilgrims left The Berry Schools. She also tells Stella about the dormitory fire and that they are trying to replace it with a fire proof dorm. 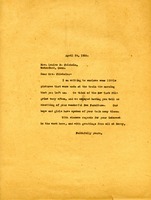 Thank you letter for the receipt of pictures of the New York Pilgrims. 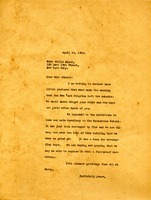 A letter thanking Martha Berry for sending pictures of the New York Pilgrims. 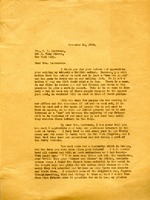 A letter from Martha Berry to Louise B. Chisholm talking about the New York Pilgrims, which was a group of people who would travel to the Berry Schools annually. 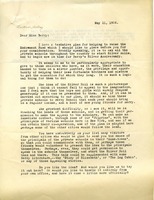 Miss Berry writes to Miss Achelis to thank her for writing a "splendid" article about Berry and says that they will use it in the next edition of the Highlander without her name as she requested. She thanks her for her support as a New York Pilgrim. Shelley Jackson proposes a plan to raise money for Berry's Endowment Fund. She thinks it is fitting to ask private school students who have had "their education handed to them on a silver platter" the opportunity to give to less fortunate students. She says that Berry could contact private school principals, starting in New York, and ask them to start Silver Rolls and have money in time for Berry's Silver Anniversary. 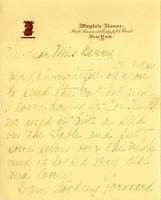 Mrs. Jackson asks Miss Berry to write back frankly and give her opinion of the plan. 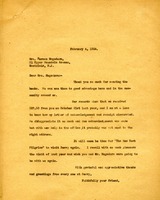 Emily Hammond's 1926 letter includes a cheque (check) from Mrs.(?) 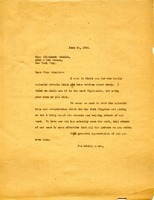 Cushing to Berry and indicates they will appreciate receiving Miss Berry's "lovely letters." Hammond then thanks Miss Berry for the Kodak pictures and the Alumni Magazine, and she also suggests Miss Berry bring or ship the movie from "the meeting" a few days ahead of her arrival. 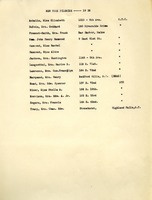 This documents lists the names of the "New York Pilgrims" who will visit Berry. 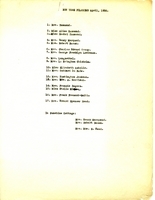 Included in the list are Alice and Rachel Hammond, Mrs. Henry Marquad, Mrs. Robert Bacon, Mrs. Charles Tracy, Mrs. George Lawrence, Mrs. Lenzettel, Mrs. L. Bringham Chisholm, Mrs. Elizabeth Achelis, Mrs. Goddard Du Bois, Mrs. Huntington Jackson, Mrs. Edward Morrison, Mrs. Rancis Rogers, Miss Stella Minor, Mrs. Frank Fremont-Smith, and Mrs. Edward Mead. 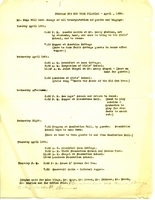 This document is the program of events for the Pilgrims' visit to The Berry Schools. It includes the dates of the visit and the many events that will occur.